Your Limo Bus Rental Service awaits with our Luxury Buses! Our Limo Bus in Toronto caters to those wanting to get a little more than some party out of your night. 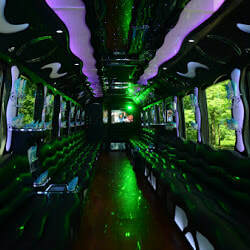 Party Bus Toronto VIP is here to offer you the best in party bus events. We take your experience and boost it to the next level as you travel in style and flare in the party limo bus, all the while you enjoying memorable event that has lasting fun and impression. With top of the line luxury and amenities that are there to make your party bus and limo bus an event to remember. Your party bus rentals & Limo bus rental event starts with us! With great features of our party bus and limo bus rental services, you can truly plan an event that will be exciting and memorable. We are here to make sure that this event is brought to life with excitement and fun. Your party starts with us! Call or click today and get your next party bus scheduled, and enjoy a night that you will never forget. ﻿Great features for your Party Bus & Limo Bus Venture! Here is what makes us shine above the rest with our party bus events. What type of event are you planning? Our party bus and limo buses are chalked full of the best technologies and amenities. With a full bar and a flat screen plasma screen television, along with internet and a telephone, these are just some of the great features. With the size of our party bus, you and many of your friends can party comfortably inside. You can take it to an exotic side with a stripper pole and full surround sound music, if that appeases your will. No matter the type of event that you want planned, our party bus can fulfill your needs. Our party buses and limo buses is a part of an emporiums fleet that is backed by one hundred percent safety inspected. Each element of the party is thoroughly inspected before each event. This allows for you to have a good time and not worry about breakdowns are any of your amenities not functioning properly. This includes that the bar is properly cooling and the lighting system is functioning, as well as the motor and interior of the limo bus. This gives you the satisfaction knowing that your event will go on without a hitch. When you are partying in your party bus, we now that you might want to go other places, other than your party bus itself. We have many packages that include the faction of letting you have endless stops on your trip. This allows for you plan the night as it comes. If you want to stop and enjoy some live music, we will take you there, or maybe of you want go to a nice quiet pub and enjoy a drink outside of your party bus, we can make that happen. No matter your plans, we are here to make sure that it comes to life with our Toronto limo bus rental services.